Close to six PM I removed all the default bookmarks from Firefox and imported the culled bookmarks HTML backup I had created yesterday to only restore the keymarks and live bookmarks. 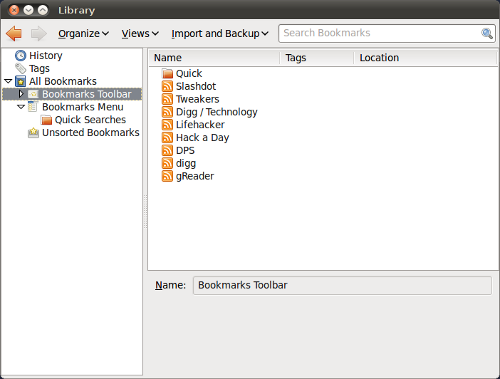 The default bookmarks were deleted via the formerly more aptly named "Bookmarks Manager", the "Library". I opened this dialog window by selecting "Organize Bookmarks..." in the "Bookmarks" menu of Firefox. 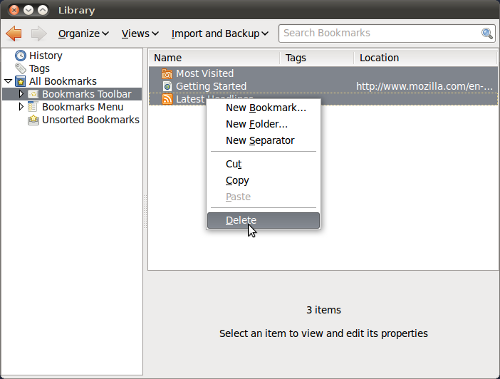 Next I selected in the left pane of the "Library" dialog the "Bookmarks Toolbar" entry under "All Bookmarks", selected all bookmarks in the right pane, and selected the "Delete" option in the context (right mouse button) menu. Then I repeated this step for the "Bookmarks Menu" entry in the left pane. Since the "Unsorted Bookmarks" entry was still empty, I was done. The modified version of the bookmarks backup was imported via the "Import HTML..." entry in the "Import and Backup" menu of the "Library" window. Since the imported "Bookmarks Toolbar" ended up under the "Bookmarks Menu" entry I had to manually cut this folder's contents and paste it under the actual "Bookmarks Toolbar" folder. Finally I deleted the, now empty, imported "Bookmarks Toolbar" folder. Imported bookmarks and folders after some reorganization.